Where is The Sweeney filmed? 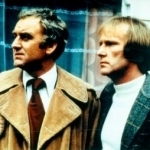 This hard-hitting, 1970s detective drama series focused on two disenchanted members of the Flying Squad: gritty, no-nonsense, corner-cutting, rule-bending Detective Inspector Jack Regan (played magnificently by John Thaw), ably assisted by Detective Sergeant George Carter (Dennis Waterman). With its hard-edged realism, colourful language, strong plots, car chases and ferocious action, the show set new standards for TV detective drama and was highly influential (an obvious recent candidate being the pastiche Life on Mars). It had a solid run, stetching for more than 50 episodes and four series from 1975 to 1978. Although it was definitely beginning to flag towards the end, the early episodes were utterly cracking and are well worth watching. The series, which also spawned two movies, became the highest-earning foreign export for Euston Films. In Germany it is known as af Die Fuecshe (The Fox). Apart from the main characters (always watchable), there's some fascinating actors to spot. Look out for John Hurt, George Cole, Bill Treacher and June Brown (EastEnders' Arthur Fowler and Dot Cotton), Diana Dors, Brian Blessed, Maureen Lipman, Roy Kinnear, Karl Howman, Ray Winstone, Hywel Bennett and Warren Mitchell. And in a late (and not especially noteworthy) episode in the fourth series, Morecambe and Wise appear, a return compliment for when Thaw and Waterman were the guests on the comedy duo's show.